Well, according to the system I use for my cards, his diet is money and his habitat is wall. Good enough. In general, I gotta say that "Make the valley great again" was an idea I had in the last second of making the card. It just fits this too well, originally I wanted to put a link in this area, either loser.com or trumpdonald.org/. If stuff like that is written in the stars, then hoo boy, the stars have a very special kind of humor. Well...April 1st is over (it is at least in my country), so when I say that another card will come this week, it's no joke. The finished thing should be done on sunday. I hope. So, onward to the new card. 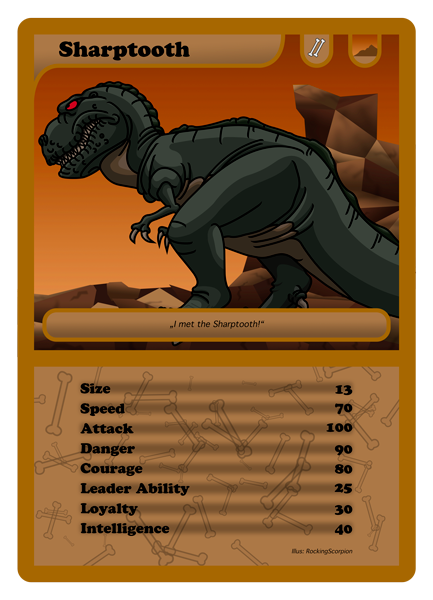 This one really took a while and a lot of thoughts went into this and also in the cards that still have to be made. A lot of stuff was finally established, and Malte279 came up with an excellent idea. I won't say what it is, but let me tell you it is just as this guy says. 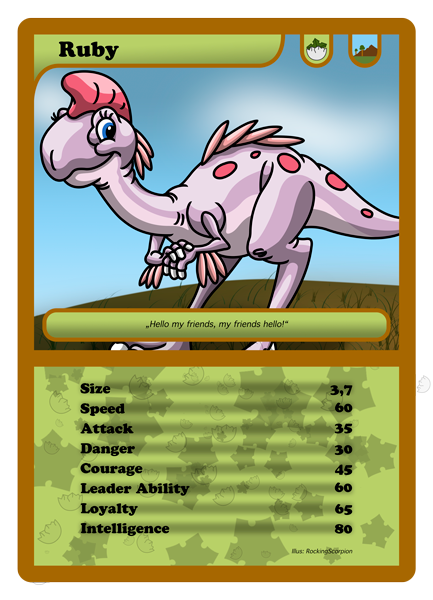 Ruby is an omnivore, so she comes with a new symbol: Eggshell combined with treestar (prehistoric Kinder Egg, anyone? ). 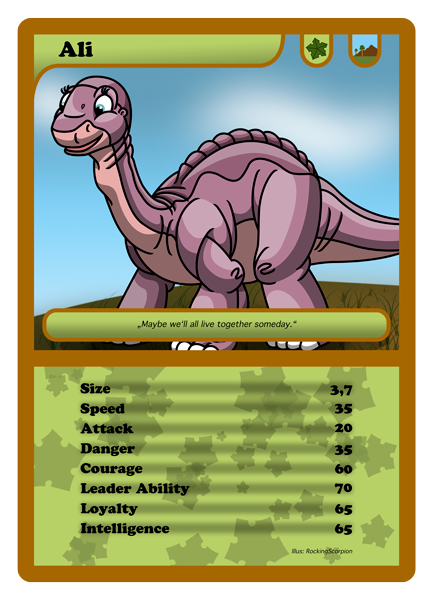 The egg also appears alongside the treestars in the values space on the card. The actual symbol was one of Malte's ideas as well, what I had it mind for the omnivores was a treestar together with a bone. I for one think the egg+treestar symbol is the better choice in that matter, so that's going to be the symbol I will use from now on. What these symbols actually do in the gameplay...well. You'll know soon enough. Also I wanna thank everyone that my april fool's joke was so well received. Next year's going to be quite something as well, I'm pretty sure of that already. Until the next card, and for the standalone image of Ruby, see my art topic as usual. Ssshhh, kinder eggs are illegal contraband in the U.S. This is brilliant! Ruby looks great in this shot. Can't wait to see the next card. look who is SOOOOOOOOOOOOOOOOOOOOOOOO shiny! DarkWolf: Don't worry, Kinder Eggs are legal in the great valley. After all, if it doesn't exist yet, it can't be forbidden. And thanks for all the comments. About that last card: Trying to squeeze that character in a place that's so small, well...I tried, but after a while went for something new for the cards. This might be what I do for the characters that just won't fit into that small space without too many details getting lost. It's also not 100% final yet, I might still make some changes to the appearance. I'm still posting the result I've got so far to see how it is received. What character will be next? Now this is just brilliant art. 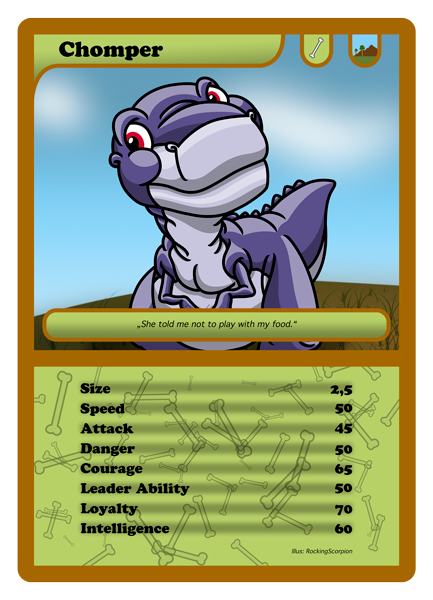 Chomper looks really innocent here, showing that he is not a ruthless minded Sharptooth but The friendly Sharptooth we all know. Now Sharptooth looks awesome his facial expression was surprising I expected him to look a lot more menacing but even then it is still an awesome bit of work and the icing on the cake being Littlefoot's mother, she looks wonderful in this albeit a bit big but she's a Longneck for crying out loud she is supposed to be big. very good work, very well done indeed. Thanks for all the comments, guys, the amount of support this project has gotten so far is amazing. 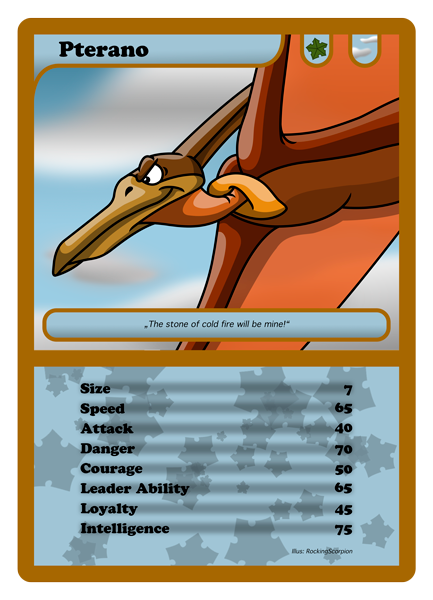 I'm still getting the full art card design down (currently looks like this) but another card was just finished. Earlier today I also found the very first design idea I made for this project. Click here if you wanna see that. This project has really evolved since then. My skills also get better which every single card and I gotta say, that's pretty motivating. I wonder where we'll be when the last card is done. 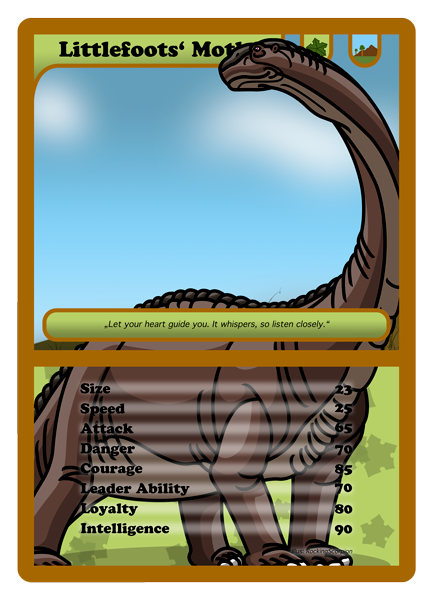 Next one will probably the first double character card, featuring Littlefoots Grandparents. No idea when it'll be done though. That's it for now then, comments and feedback is always appreciated, and for the standalone pictures you can check my art topic if you want. Looks like a fun card game. You have my full support. Can't wait for next card! Updates might come (somewhat) regularly again now. That's a fantastic job you did making this card. The details are amazing and the colors are amazing. How did this thread elude me for so long? Those cards of yours are gorgeous, Rocks!